By investing in a pool fence for your landscape, you are not only investing in a safety feature for your pool, but also an aesthetic element for your landscape as well! 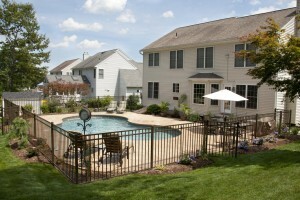 With summer just around the corner, now is the time to start thinking about opening your pool for the year. While many people may consider their pool to be the center of their outdoor space, not many people think to invest in a pool fence for their landscape. By investing in a pool fence for your landscape, you are not only investing in a safety feature for your pool, but also an aesthetic element for your landscape as well! Consider these four reasons to invest in a pool fence for your landscape this year. Particularly if you have children who love to play outside, your pool fence is an important feature for keeping everyone at home safe around the pool. This ability to control access to your pool is crucial for preventing children from falling into the pool or attempting to swim without adult supervision. In addition to serving as an important safety feature, your pool fence can also add aesthetic appeal to your landscape in any season. Even during the winter months when your pool is closed for the season, your pool fence will continue to provide a polished look for that part of your landscape design. With an aluminum pool fence installed by Mid-Atlantic Deck & Fence, you can enjoy a new pool fence for your home without worrying about maintenance needs and durability throughout the year. Unlike a traditional wood fence around your yard, your aluminum pool fence will hardly require any maintenance in between seasons. In addition to protecting your kids as they play outside, your pool fence will also help to protect your pets as they enjoy your yard as well. With a professionally installed pool fence, there is minimal risk of your pets falling into your pool as they are running around your yard. Additionally, your pool fence can provide you with peace of mind that your kids and pets are safe as they enjoy playing in your yard throughout the year. Call Mid-Atlantic Deck & Fence For Your New Pool Fence in 2019!